I LOVE this dinner! 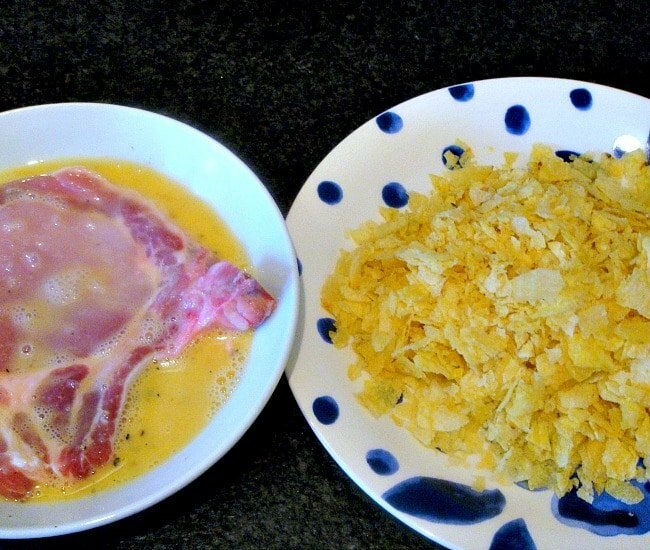 Here you have a simple Pork Chop, transformed into a moist and very tasty piece of meat, with a gentle flavour of pineapple and a lovely crunch from your favourite potato chips. Yes! you read that right…potato chips! 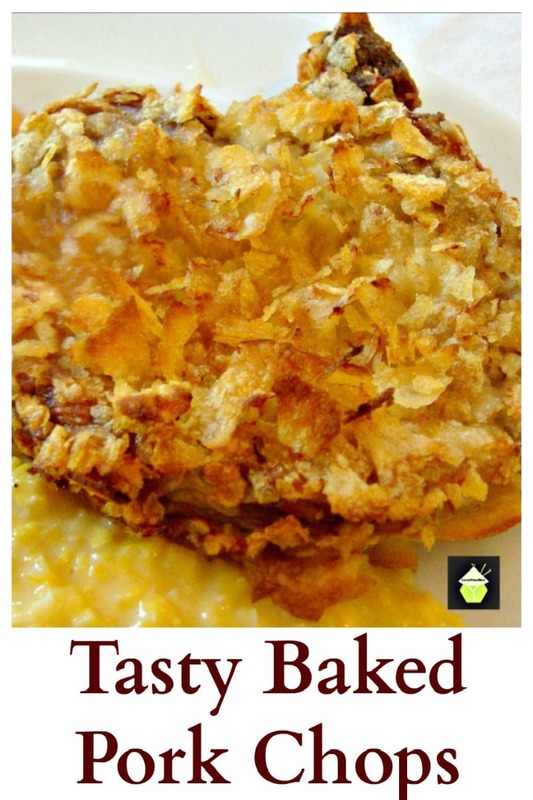 It makes for a delicious crispy coating with a flavour from the potato chips. The sky’s the limit as far as what flavour chips you want to use. Just experiment and see for yourself. The Pork chop combined with my delicious Pineapple Corn Rings (now they are so delicious with a great batter) and some home made creamed corn makes for a perfect meal! I also had some Sweet Chili Sauce with my dinner, and that too worked perfectly with the flavours! So let’s see what we need to do to get a great dinner ready. 1. Take your pork chop, season with salt and pepper, and place in a dish with enough pineapple juice to cover it. Stab holes in the chop using a knife or a fork. 2. Cover and place in the fridge for 1 hour. 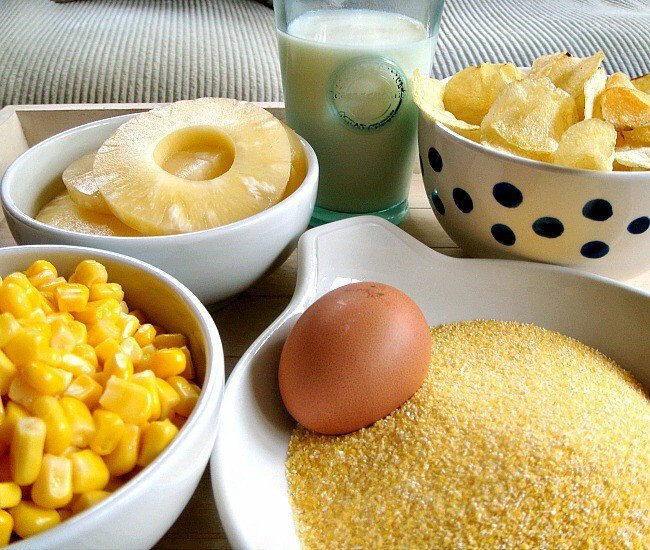 ***** If you are making the Pineapple corn rings, use the pineapple juice from the can of pineapples. 3. In a ziplock bag, place your potato chips and crush them so they are a little rough. 4. Whilst the pork is marinating, make a start on the Creamed Corn and batter for the Pineapple Corn Fritters . 5. Preheat your oven to 220 C / 425 F / Gas 7. 6. Drain the pineapple juice and discard. Place the pork chop in the beaten egg and coat it completely. In a separate dish, place the crushed potato chips and then coat the chop in the chips. Push the chips with a little force and then transfer to a baking tray. I used parchment paper on the tray. Then place in the oven. The cook time for the chops will vary depending on their thickness. As a rough guide, for a chop 1 inch (2.5 cm) thick, it will take approximately 20 -25 minutes. Thicker chops will of course take a little longer. When the chops are in the oven, you can cook the Pineapple Corn Rings so everything will be ready at the same time. When the Pork Chop is ready, allow to rest on the baking tray for 5 minutes. I LOVE this dinner! Here you have a simple Pork Chop, transformed into a moist and very tasty piece of meat, with a gentle flavour of pineapple and a lovely crunch from your favourite potato chips. Yes! you read that right...potato chips! 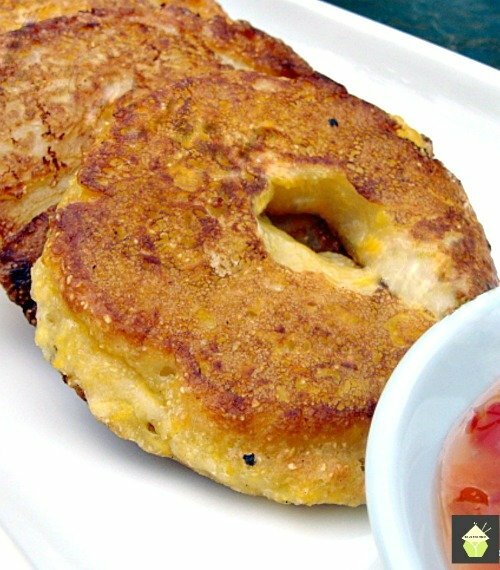 It makes for a delicious crispy coating with a flavour from the potato chips. The sky's the limit as far as what flavour chips you want to use. Just experiment and see for yourself. The Pork chop combined with my delicious Pineapple Corn Rings (now they are so delicious with a great batter) and some home made creamed corn makes for a perfect meal! I also had some Sweet Chili Sauce with my dinner, and that too worked perfectly with the flavours! So let's see what we need to do to get a great dinner ready. Take your pork chop, season with salt and pepper, and place in a dish with enough pineapple juice to cover it. Stab holes in the chop using a knife or a fork. Cover and place in the fridge for 1 hour. In a ziplock bag, place your potato chips and crush them so they are a little rough. 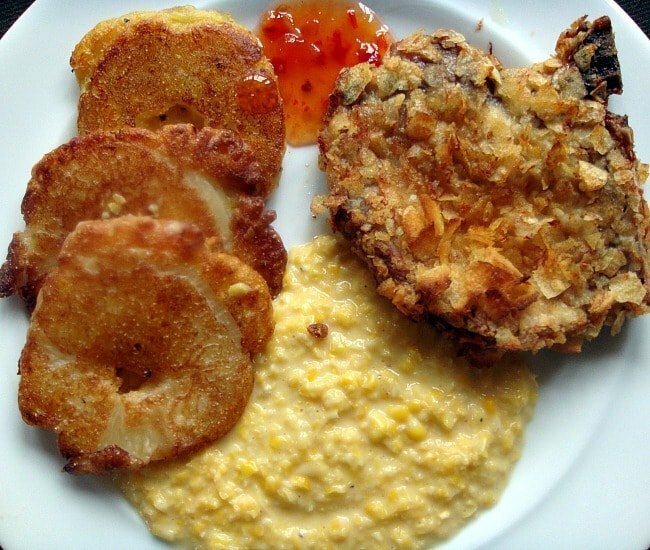 Whilst the pork is marinating, make a start on the creamed corn and batter for the Pineapple Corn Fritters . Preheat your oven to 220 C / 425 F / Gas 7. Drain the pineapple juice and discard. Place the pork chop in the beaten egg and coat it completely. 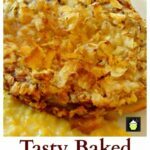 In a separate dish, place the crushed potato chips and then coat the chop in the chips. Push the chips with a little force and then transfer to a baking tray. I used parchment paper on the tray. Then place in the oven. BBQ chips are really good! yes, I imagine they would be really tasty with the pork! Where do you get ham potato chips?never heard of them. It depends where you live Rose. I know Leslie Clover chips do a ham & cheese flavour, but you can choose any flavour you enjoy….and I like the ham very much! Maybe Lays do them? They have ‘ham’ flavored potato chips?? Really?? Interesting…. Jeanette, they were even Smoked ham flavoured. Wowza!